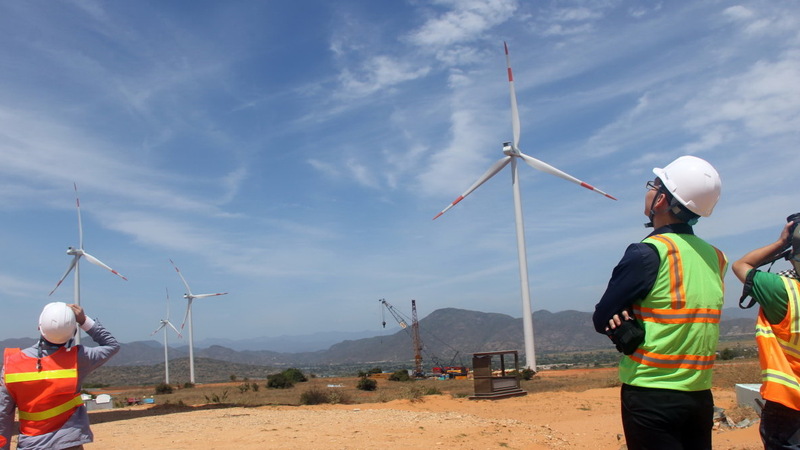 Workers look up at the wind turbines of Phu Lac Wind Power Plant in Binh Thuan Province, one of the Germany-funded sustainability projects in Vietnam. Vietnam and Germany welcome their 20th year of cooperation in science and technology as ongoing Germany-funded sustainability projects continue to shape local localities. “Vietnam is a land of optimism,” Andreas Siegel, Germany’s Consul General in Ho Chi Minh City, asserted during his opening remarks at the German Science Day held in the southern Vietnamese metropolis on Wednesday. The event, attended by government officials, diplomats and scholars from both countries, celebrated the 20th anniversary of bilateral cooperation between the two countries in science and technology. For the past twenty years, Germany and Vietnam have continued to strengthen bilateral ties through research and cooperation in each field, placing a particular emphasis on the sustainable development of Vietnam’s current socio-economic and environmental landscapes. Vietnam’s fast-growing economy has placed tremendous pressure on the country’s fossil fuel-dependent electricity production over the past few decades. According to reports by state-owned power company EVN, Vietnam’s annual electricity production increased more than tenfold between 1990 and 2014, from 8.6 terawatt-hours (TWh) to 145.5TWh. The annual increase in power production during this period was between 12 and 15 percent, almost twice as high as the country’s corresponding GDP growth. As of 2014, Vietnam’s dominant sources for power production had been hydropower (40.04 percent), natural gas (21.89 percent) and coal (28.94 percent), while wind power accounted for a mere 0.15 percent of the country’s 34-gigawatt electricity generation capacity. But Vietnam is looking to substantially expand the share of renewable energy in its national production of electricity, with the help of Germany-funded projects. The country’s current goal is to have the ability to produce 800MW of electricity from wind power by 2020, and 6,000MW by 2030. Its targets for solar energy are set even higher, at 850MW by 2020 and 12,000MW by 2030. In total, Vietnam is aiming to produce up to 21 percent of its electricity from renewable sources, including biomass, wind, and solar, by the year 2030. The German government-funded project ‘Support to the Up-Scaling of Wind Power in Vietnam’ aims to address these goals by offering technical assistance between 2014 and 2018. The EUR6.9 million (US$7.3 million) project, jointly implemented by Vietnam’s Ministry of Industry and Trade and the Deutsche Gesellschaft für Internationale Zusammenarbeit (GIZ), is intended to improve legal and regulatory frameworks, develop technical, financial and practical capacity, and facilitate partnerships between the two countries. As part of the project, a call was made in June 2016 for research proposals on wind power in Vietnam which yielded nine submissions from Vietnamese universities and research institutions. The three best submissions were each granted EUR100,000 ($105,700) in research funding over the next two years, from 2017 to 2018. Germany has been a close partner of Vietnam in research projects across other facets of science and technology aimed at paving the way toward a more sustainable future. As many as 16 Germany-funded project sites are currently established throughout Vietnam, featuring research in fields such as resources, urban development, bioeconomy, health, and climate protection. 'Rapid Planning,' an action-oriented research project looking to develop sustainable infrastructure, environmental protection, and resource management for highly dynamic metropolises, is currently operating in the vibrant central city of Da Nang. Study scholarships and research grants totaling EUR10.89 million ($11.51 million) will also become available for research fellows from Vietnam, among other developing Asian countries, under a framework program on sustainable water management (NaWaM) initiated by Germany’s Federal Ministry of Education and Research (BMBF). In total, the BMBF has invested over EUR20 million ($21.08 million) in bilateral cooperative activities in science and technology over the last 20 years. Vietnam is among five key countries where Germany looks to intensify cooperation in the near future, according to Frithjof A. Maennel, deputy director general of the BMBF’s International Cooperation in Education and Research, who made the statement at Wednesday’s event. With this year’s expected inauguration of the German House in Ho Chi Minh City, a center where all German cooperative agencies will be represented, Vietnam-Germany bilateral cooperation in science and technology is slated to yield fruitful results for decades to come.